Fresh from three stage wins at the Tour of Turkey, Mark Cavendish (Etixx-QuickStep) continues his path toward July’s Tour de France at the 10th edition of the Amgen Tour of California, starting on Sunday (May 10-17). The British sprint specialist will face stiff opposition in bunch gallops in the American stage race, with German Marcel Kittel (Giant-Alpecin), Australian Matt Goss (MTN-Qhubeka), American Tyler Farrar (MTN-Qhubeka) and Tour green jersey champion Peter Sagan (Tinkoff-Saxo) all vying for stage glory. Last year, Cavendish took two stage wins in the race. On paper, Cavendish’s big rival should be Kittel, but the Giant-Alpecin sprinter has endured a very different season to Cavendish. Where Cavendish has amassed nine victories thus far in 2015, Kittel has just one – January’s People’s Choice Classic. Since then, Kittel has suffered from the lingering effects of illness, and withdrew from the opening stage of the Tour de Yorkshire last Saturday. South African team MTN-Qhubeka may collectively provide Cavendish’s biggest headache, with four riders capable of contesting sprints: Goss, Farrar, German Gerald Ciolek and Dutchman Theo Bos. Those four are so closely matched that the team’s problem may be picking and backing its potential strongest finisher for each the day. Sagan always goes well in California, having won the points classification for the past five years – and taken at least one stage win in each of those years. Since moving to Tinkoff-Saxo for 2015, Sagan has taken just one victory – a stage of Tirreno-Adriatico – and will be looking to add to this meagre tally in California. History suggests that he will, but it’s doubtful he will repeat his 2012 feat of taking five stage wins in the race. With 2014 Tour of California winner Bradley Wiggins absent, overall honours will shift to a new rider. The only previous winner in the race is Robert Gesink (LottoNL-Jumbo), who took the win in 2012. He will likely share team leadership duties with Laurens Ten Dam as they take on opposition from Andrew Talansky (Cannondale-Garmin), Warren Barguil (Giant-Alpecin), Sergio Henao (Sky), Matthew Busche (Trek), Phil Gaimon (Optum) and Briton Peter Kennaugh (Sky). 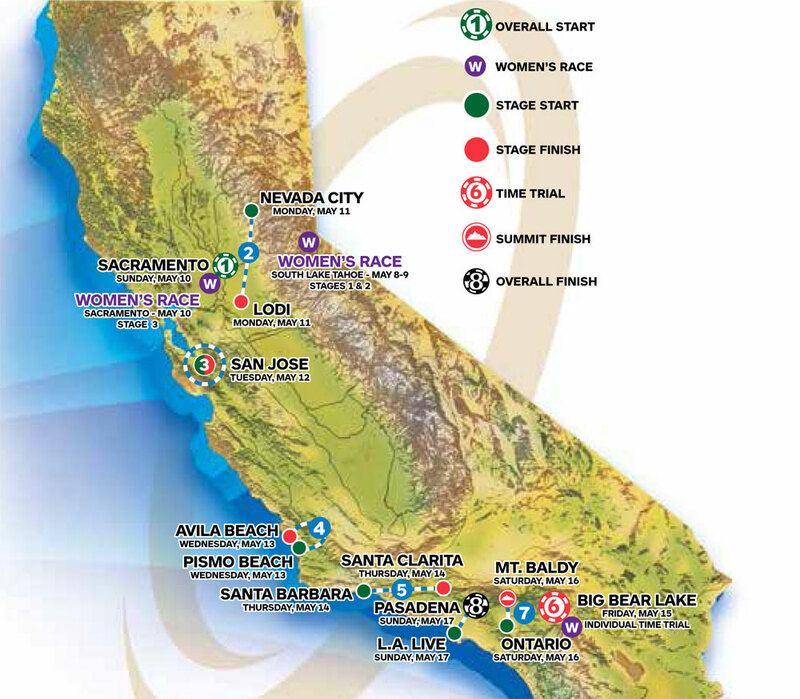 The 2015 Amgen Tour of California kicks off on Sunday, May 10, in Sacramento and concludes with its eighth and final stage finishing in Pasadena on Sunday, May 17. Key stages to shape the final general classification will be the stage six individual time trial and a mountain finish on stage seven to Mount Baldy. The inaugural Women’s Tour of California takes places from May 8-10, with a separate time trial at Big Bear Lake on Friday, May 15.